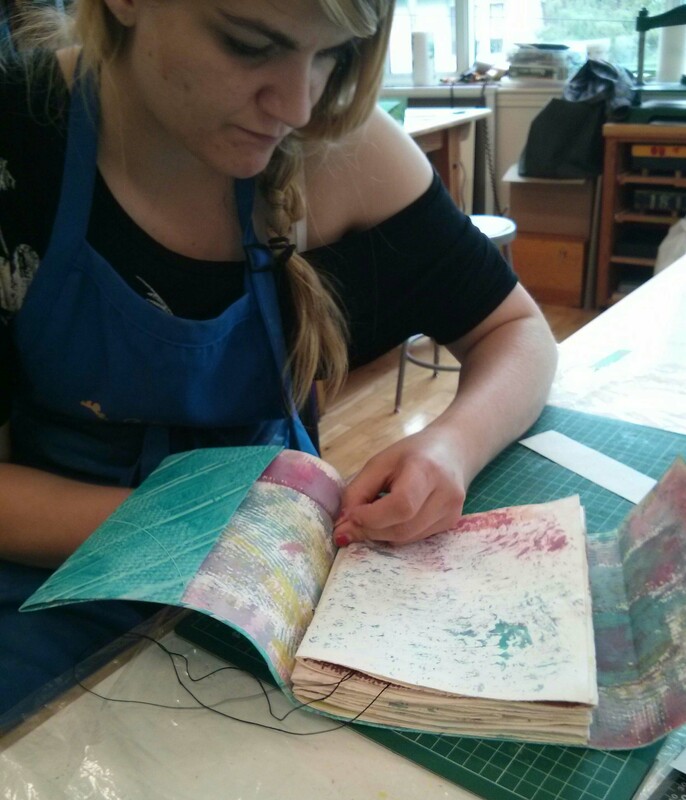 The GTA In-Studio courses are held at the CBBAG bindery, as well as other locations in Toronto. The CBBAG bindery is located at 180 Shaw Street, Toronto (just north of Queen Street West, in the West Queen West district of Toronto). Other course locations' addresses can be found with the course descriptions or will be provided upon registration. If you'd prefer to register by mail, click here for a mail-in registration form for payment by chq. or money order. In addition to its In-Studio courses, CBBAG has a Home Study Programme. Click here for information on the Home Study Programme. To find out what your local chapter is offering as workshops, please visit the Regional Chapters section. James Spyker will be hosting an open studio at the bindery most Thursday evenings (please check http://cbbagtoronto.com/events/ for last minute updates to the schedule). The bindery will be open for CBBAG members from 6:00 till 10:30. It will be a chance for you to work on your own projects but James will be around to answer questions and give advice. He's had lots of experience making mistakes and sometimes figuring out how to recover from them. We'll be asking CBBAG members to chip in $10 or PWYC each evening to help cover our bindery costs. If we are lucky we'll be sharing the space with some Paperhouse friends during these evenings too. They may be making paper or joining in on the bookmaking fun. One thing to note is that CBBAG's tools and equipment in the Toronto bindery are primarily for the purposes of education. An attendee's use of any CBBAG tool or piece of equipment will be at discretion of the volunteer hosting the open studio evenings. You should also check out the Paperhouse Studio events happening in our shared space! CBBAG has developed a series of core curriculum courses, which can lead to the CBBAG Certificate of Completion. Click here for information on these courses. More information on the Certificate of Completion can be found at the bottom of this page. One-day courses are generally open to both members and non-members alike for the same price. Most other courses have a members' and non-members' price. The non-member price includes a one-year CBBAG membership. If you plan to take a GTA workshop which has both a members' and non-members' price and you are not a CBBAG member, please do not join CBBAG first as there will be a delay in "approving" your membership and you will not be able to register at the members' price immediately after joining CBBAG. Please register for the workshop at the non-member price and your membership will be processed from your workshop registration (this may take a week or two, depending on the schedule of the membership/workshop registrar). Applications for workshops can be done via this website (click on the "GTA Workshops" link on the left pull-down menu), for payment by Visa or MasterCard, or sent in by mail to the CBBAG office. To register by mail, please include full details of the course(s) you wish to register for, your full contact information, and either your Visa or MasterCard credit card number and expiry date or a cheque payable to "CBBAG." Mail your registration to CBBAG Workshops, 180 Shaw Street, Unit 102, Toronto ON M6J 2W5 (new address effective August 1, 2017). Click here for a mail-in registration form for payment by chq. (or credit card). Registrations are not accepted from two days prior to the commencement of a workshop. Acceptance to workshops is assigned on a chronological basis. Acknowledgement of registration will be sent by e-mail; if you have not received your acceptance one week prior to the start of the workshop, please inform the Workshop Registrar at workshop@cbbag.ca or phone 416-581-1071 416-581-1071. Receipts are available upon request. Please e-mail the CBBAG office at workshop@cbbag.ca to request a receipt. CBBAG is pleased to discuss organizing additional workshops; please contact the office at workshop@cbbag.ca. Any allergies or other environmental sensitivities should be mentioned when applying. The CBBAG bindery is on the main floor of 180 Shaw Street in Toronto. There is a wheelchair ramp at the front of the building and an elevator between the entrance level and the first floor. Other GTA workshop venues may require the use of stairs to access them. Cancellations, subject to a 10% cancellation fee (a minimum of $5), will be accepted until two weeks prior to the workshop; thereafter the full fee will be forfeited. CBBAG reserves the right to cancel workshops two weeks prior to their commencement due to insufficient enrollment; fees for cancelled workshops will be fully refunded. As well, CBBAG reserves the right to cancel or reschedule workshops without notice in the event of serious illness, accident, or any unavoidable or unforeseen circumstance; fees for cancelled or rescheduled workshops will either be fully refunded or applied to the rescheduled workshop; participants who are unable to attend a rescheduled workshop will have their workshop fee fully refunded. Membership fees (and the membership fee portion of the non-member fee) are not refundable. Workshops are limited to eight participants (some exceptions apply), and generally run from 10:00 am to 5:00 pm. (full details available with the course descriptions). For courses requiring a prerequisite of Bookbinding I, Bookbinding II, or Bookbinding III, successfully completed CBBAG Home Study courses in the Monitoring Stream can be used as prerequisites for in-studio courses (Home Study Resource & Reference Stream courses cannot be used prerequisites for in-studio courses, unless permission is obtained from the instructor). Participants are responsible for arriving on time at the correct location; call the CBBAG office if directions are needed. Materials fees are paid to the instructor at the beginning of a workshop. Participants should plan to bring a brown bag lunch (particularly for workshops at Betsy Palmer Eldridge's studio as there are no restaurants or convenience shops near by her studio). There is a fridge and a microwave in the studio if you bring your lunch. Artscape has eating along the main floor hall for lunchtime. There is a snack bar on the mezzanine level of 180 Shaw Street, Two Penny Cafe, which also has a small cafe/store across the street from 180 Shaw. Due to the intensive nature of CBBAG workshops, it is not possible to make up missed days; fees cannot be refunded. CBBAG instructors have the right to dismiss disruptive students; fees will not be refunded under these circumstances. Click here for some suggestions of possible accommodations for out of town students. There are also many restaurants in the neighbourhood for after class, on Dundas Street West, Ossington Avenue, and Queen Street West. the bullding is right at the corner. About a 10/15 minute trip from the subway. 1. TTC Dundas 505 streetcar westbound from Line 1 (Yonge or University Line) at Dundas or St Patrick stations. to the traffic lights (2 short blocks) in from of Artscape. Street stop; proceed south 2 short blocks to Artscape at the traffic lights. 3. Queen streetcar stops at Shaw Street, then walk north one block to Artscape (please note that the Queen streetcar generally has the name of the last stop on the line on its front, not "Queen Street"). restrictions are different than those on weekdays. The closest community parking lot is a Green P lot on south side of Dundas Street just east of Ossington Avenue. CBBAG gives a "certificate of completion" on completion of all six of the core courses whether taken In-Studio or a combination of In-Studio and Monitoring Stream Home Study. The six are Bookbinding I, II, and III, Restoration & Repair, Finishing, and Paper Treatments for Binders. Please note that only Bookbinding I, II and III are available through the Monitoring Stream of the Home Study Programme; therefore, in order to qualify for a Certificate of Completion, one must complete Finishing, Restoration & Repair, and Paper Treatments for Binders in-studio. The Certificate of Completion is not formal accreditation. However, CBBAG has had students who were already working in conservation jobs who started back at the beginning with CBBAG, completed the six courses, and were extremely pleased with the mass of material they had learned and found it extremely useful in their work.